When you meet Fred Dunand, owner of Saturn Materials Concrete Masonry Products, in Columbus MS, his passion for the masonry industry is quite evident. Having worked in the masonry industry for the past 20 years, he is still considered a young professional. “I am always excited with new developments in masonry,” states Dunand. “We push the envelope with fresh eyes and perspective and explore how things have been done for years.” Dunand reached out to nearby Mississippi State University (MSU), and partnered with the Department of Architecture, working with students to gauge their interest in entering this year’s National Concrete Masonry Association (NCMA) Unit Design Competition. Soon students were ready to compete against each other. The first round of competition was held at MSU to determine who would represent the University at the NCMA competition in Chicago. Industry experts including a mason and architect were brought in to judge the competition at MSU. In the national event, they faced stiff competition from several universities, many of whom have won or placed in this competition before, including teams from Iowa State University, who took second place, and Ball State University, who took 3rd place. NCMA Vice President of Engineering Jason Thompson said the competition is designed to expose the next generation of architects and engineers to concrete masonry and hardscape products as a material and a building system. “The MSU entry was highly innovative both in its design and application,” said Thompson. “Students considered an array of aspects starting with manufacturing feasibility to serviceability and performance in the field. The jury was impressed with the quality of the submission.” Professor Gines added, “Success at the 2018 NCMA Unit Design Competition is certainly attributed to the engagement, mentorship and support provided by Dunand and Saturn Materials.” Dunand is on a quest to continuously develop new creative products. 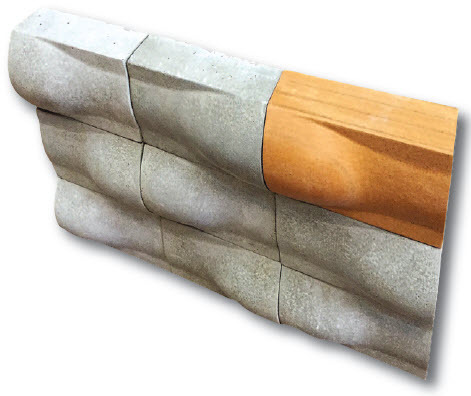 The Pulse is designed to be used as coping that would be installed at the top of the wall or in other applications where a solid block is desirable, the monolithic shape combined with an elegant curvature to the block face, economizes the manufacture and shipping process. Having never been a part of this competition, it was an unprecedented honor for Mississippi State’s team to take first place! “This year marks the 100th anniversary of NCMA and the first year that the MSU School of Architecture has been involved in the Unit Design Competition,” stated Gines. “Working with the architects of tomorrow is a privilege. 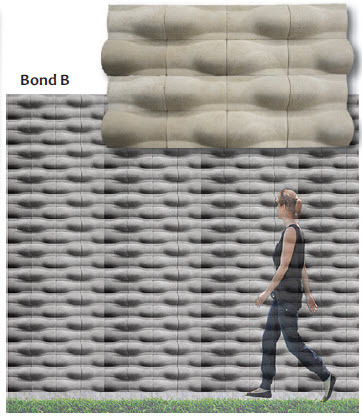 They are the future to be designing with concrete masonry. This experience will bring product knowledge, attributes, advantages and efficiencies and how it can be used as an unparalleled wall system of high performance,” states Dunand. Design of The Pulse is inspired by observing the fluidity and patterns of wind and water moving across a vertical surface. 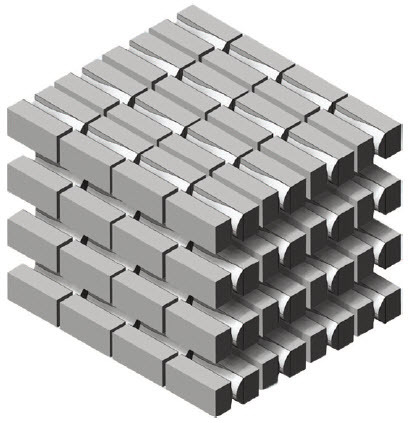 The Pulse can be arranged using various stacked bond patterns that simulate a pulsing pattern. 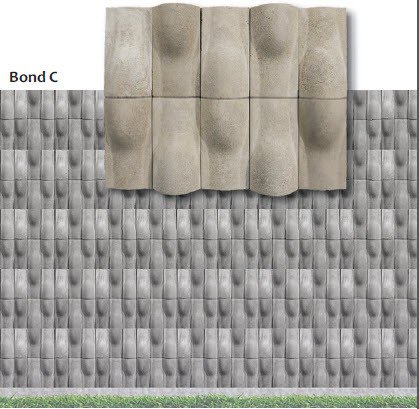 These arrangements provide for wind to gently sweep over the surfaces of concrete block and concrete brick and for water to shed off units down to the ground. 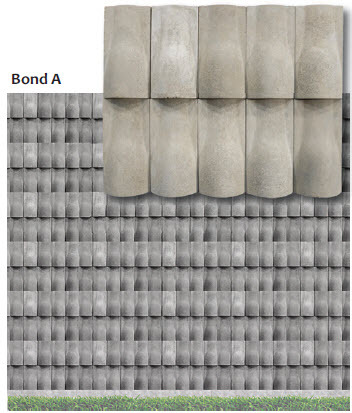 Versatility In images below bond patterns are arranged so that each unit protects the unit below by gently extending beyond and providing a drip edge to shed water. The Pulsemaintains a monolithic shape that is combined with an elegant curvature to the block face, thus economizing the manufacture and shipping process. The Pulse is not limited in its bond patterns or configurations. 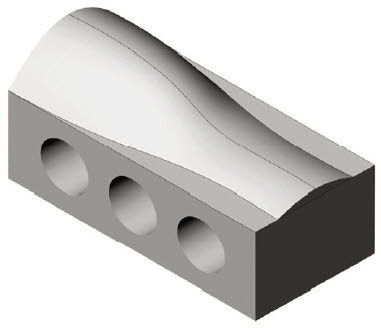 The Pulse is designed to be used as coping that could be installed at the top of the wall or in other applications where a solid block is desirable. The Pulse could also be manufactured with three cores, thus reducing their overall weight by 25%. Fly ash is used in the unit design mix to reduce carbon footprint and provide a more ecologically friendly product – 22% of the total mass and 70% of the binder. The mix also includes a fully integrated water repellent to improve durability and extend product life. For prototyping processes, a 3-D model of the block design was made to scale in Rhinoceros. Design was laser cut into MDF block that had been provided. This MDF block was then put into a frame and the inverse was created with a urethane mold. This inverse mold was sprayed with mold release and the concrete mix was poured into it and vibrated for approximately 15 minutes. After the concrete had enough time to cure, block were taken out and finished drying outside of the mold. During the Materials Science class’s first visit to Saturn Materials, they learned about strength, design and practicality of a block. They used that knowledge to inspire the creation of The Pulse. Since then, the team has continued to work with Saturn to ensure feasibility, manufacture and shipping of the product. A first run is being conducted at Saturn’s facilities.